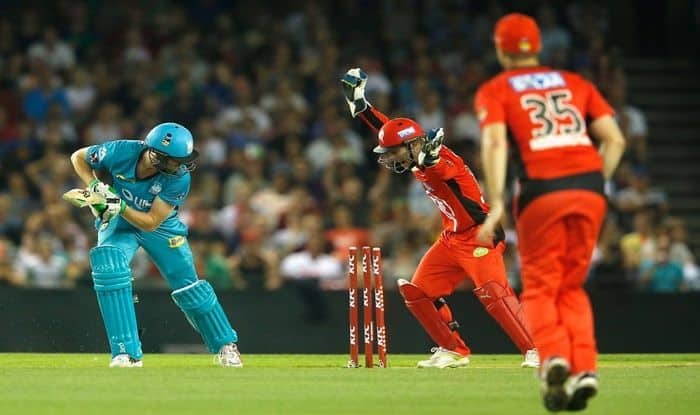 BBL 2018-19 Melbourne Renegades vs Brisbane Heat Match 29 Live Cricket Streaming And Updates: Melbourne Renegades will take on Brisbane Heat for the second time in the 29th match of the Big Bash league 8 on January 13, Sunday at the Geelong Cricket Ground. Three days back they meet in a clash at the Gabba, where Renegades registered their fourth win of the tournament by the 8-wicket margin. Heat’s frontline pacer James Pattinson, who picked up an injury in the previous encounter has been ruled out of the tournament due to injury to a side strain. It’s a huge blow for Chris Lynn-led team as he was the key bowler and looking at the current situation of the team, they need to bounce back in the team in order to make it to the playoffs. Whereas, Usman Shinwari has departed for international duty with Pakistan and is replaced by England’s Harry Gurney, who is likely to make his debut in the BBL for Renegades. Chris Lynn and Brendon McCullum are the layers to watch out for in this Sunday encounter as they both will bat to save their team from being eliminated from the BBL campaign. Adding to the fact that, Lynn has been in a red hot form and McCullum has gained is confidence and has scored back-to-back half-centuries. What time does the Melbourne Renegades vs Brisbane Heat match in the BBL 8 starts? The Melbourne Renegades vs Brisbane Heat match in the BBL8 starts at 1:05 PM IST, January 13 (Sunday). Where is the Melbourne Renegades vs Brisbane Heat match in the BBL 8 being played? The Melbourne Renegades vs Brisbane Heat match will be played at the Geelong Cricket Ground, Geelong. Which TV channels will live broadcast (in India) the Melbourne Renegades vs Brisbane Heats match in the BBL 8? Melbourne Renegades vs Brisbane Heat match in the BBL8 will be live broadcast on Sony Sports Network in India. How to watch the free online live streaming of Melbourne Renegades vs Brisbane Heat match in the BBL8? The free online live streaming of Melbourne Renegades vs Brisbane Heat match in the BBL8 will be available on Sony Liv app and Jio TV. What are the probable playing XIs of Melbourne Renegades vs Brisbane Heat match in the BBL8?